You'll love the sound and smell of the crackling fireplace in the cottages at Grange Bellinzona. Nestled in the famous spa country of Daylesford/Hepburn Springs, Grange Bellinzona's spacious grounds and manicured rose gardens welcomed us after a short but scenic drive, about one hour from Melbourne. Our kids quickly picked out their room when we arrived, and asked when we could go to the heated pool, spa, and sauna. We explored our cottage a little and I swung back into town to pick up some pizza to cook in our oven, and got some snacks for the evening. A big screen TV was at the ready for a movie night, but we opted for some swimming and board games instead. This Edwardian conference and reception venue is surrounded natural beauty; with the Wombat Forest as a backdrop, the environment is ideal for weddings, winter getaways, a relaxing retreat, or a productive business conference. We even had a couple of friendly resident kookaburras visiting us at breakfast time. Speaking of breakfast, after a comfortable sleep we meandered back to the main lodge for a full country breakfast that was included in our booking. A generous buffet of poached eggs on spinach, bacon, sausage, hashbrown medallions, and a wide variety of cold breakfast items, plus apple juice, orange juice, coffee, and teas, filled our bellies to the brim and got us off to a great start. 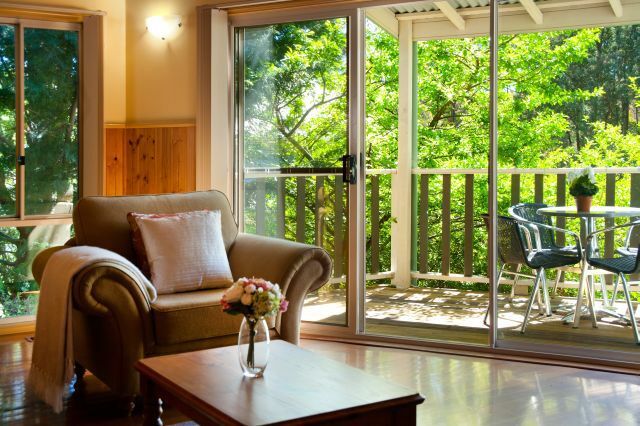 All in all, The Grange Bellinzona offers a comfortable and close getaway with great amenities, for couples, families, or corporate bookings, in a beautiful part of Victoria. Check their website for school holiday deals, spa getaways, and conference packages.